How To Fix Error SendMail function Time Out ! My Visual Database → Script → How To Fix Error SendMail function Time Out ! Topic: How To Fix Error SendMail function Time Out ! How To Fix Error or add parameter time out connect,read in function ? 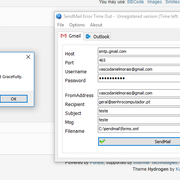 Re: How To Fix Error SendMail function Time Out ! I have checked your project, it's works, I don't get any error message. Using this example, you can control all settings. Please let me know if you find some solution.